Food not only makes up a large part of our lives, but it is also an important part of any given culture. If you look carefully enough at a culture’s diet, you might catch an important glimpse into the history, geography, and values of that group of people. Together with seven other university students, I had the opportunity to visit Durban, South Africa and the surrounding regions for four months. As guests in the homes of a handful of different groups that reside in South Africa, Mozambique, and Swaziland, we discovered complex histories, delicious food, famous sites, and a sense of family. I invite you and your students to follow me on a photographic tour that shares a taste (no pun intended!) of the culture I experienced this summer. In a place like Durban, the ukudla is as diverse as the people living there. (Ukudla is food in isiZulu, the most widely spoken language in Durban.) Most families in South Africa are native to the region and can trace their roots back to indigenous clans and tribes that occupied the land for centuries. But other South African families trace their roots to India, Indonesia, or Europe. Although many have called South Africa home for generations, they have also maintained traditions from other parts of the world. Ask your students: Bunny chow is a delicious mixture of Indian, European, and African culinary traditions. What foodie “mash-ups” can you think of? Mozambique’s largest exports—prawns and cashew nuts—brought us energy for a wonderful day on Mozambique’s Inhaca Island. Ask your students: What are the biggest agricultural exports of your region? 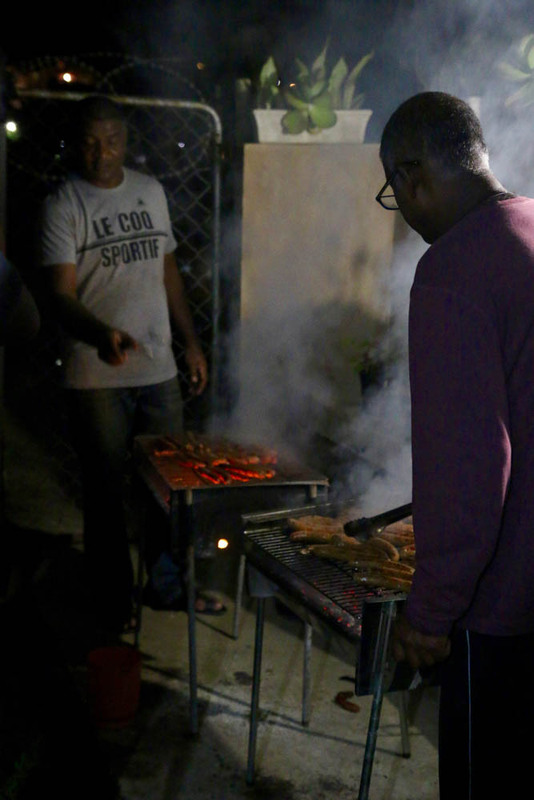 We danced into the night, fueled by delicious Indian biryani and braai’ed meat (think barbecue without the sauce) in Newlands West, a historically Indian township just outside of Durban. Ask your students: Are there any towns or neighborhoods in your region that are densely populated with immigrants (or children of immigrants) from a specific place? (Chinatown? Little Saigon?) How does that affect the culture of the area? The Zulu people are the largest cultural group in the province of KwaZulu-Natal and isiZulu is one of the most widely spoken first languages in the whole of South Africa. Zulu cultural sites like Shakaland gave us a glimpse into traditional Zulu dance and offered us a chance to see the production of Zulu beer, a beverage used for ceremonies and celebrations alike. Ask your students: Zulu beer is used in ceremonies. Can you think of any food or beverages that are associated with specific ceremonies or festivals that you take part in? South Africa’s Freedom Day brought us to a festival of craft food and local favorites near the Shongweni Dam between Peitermeritzburg and Durban. Ask your students: Food is an important part of Freedom Day, when South Africans celebrate the first post-apartheid elections held in the country. What foods do you associate with your national holiday? During my stay with a Zulu family in a township called Cato Manor, just five miles from Durban’s city center, we often ate meals of rice and curried chicken as we sat on couches together in front of the TV. Sometimes we sat mostly in silence as we watched Generations (a South African soapie that airs each night across the country). Sometimes we laughed at stories from the day. Eating together with people from another culture gave us the chance to share our experiences and learn from theirs. In these moments, I realized that no matter where we come from, as human beings, we all have much in common. Teachers: Try these discussion questions to get your students thinking about their culture’s food and traditions. You could even encourage them to create their own photographic tour! What is your favorite meal that your family makes at home? What is the best meal another family has ever made you? Do you have any traditions that your family practices? Do you know which country or region your ancestors come from? How do you feel that your family is different from the other students in your group? How are they similar? Is difference a good thing or a bad thing? What are some positives and negatives? Previous Previous post: 12 Things We Learned This Week!